Name: Financing your Green Retrofit! 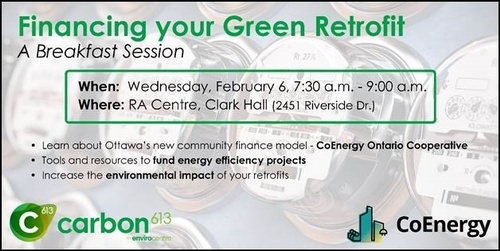 Join us for the Financing your Green Retrofit event to learn about Ottawa’s new community Finance Model – CoEnergy Ontario Cooperative for large facility retrofits. How to plan for and implement retrofits at your facility in order to reduce your carbon footprint while realizing cost savings. About local case studies, the RA Centre and more, with engineering firm J.L. Richards. Complimentary. Breakfast will be provided. Reserve here.